Bodega Bay offers some of the best beginner surf on the North Coast. Only 5 minutes away from the shop you can enjoy small, fun surf. We rent soft (user friendly) and hard longboards and shortboards, also brand new O'neill wetsuits in both mens and womens styles. (over 40 in stock). We rent skimboards, bodyboards and booties too. 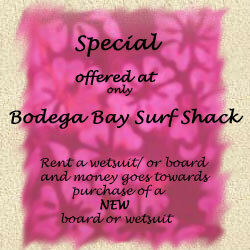 Ask about the Surf Shack Web Discount!!! Mention this site and receive 10% off on rentals.